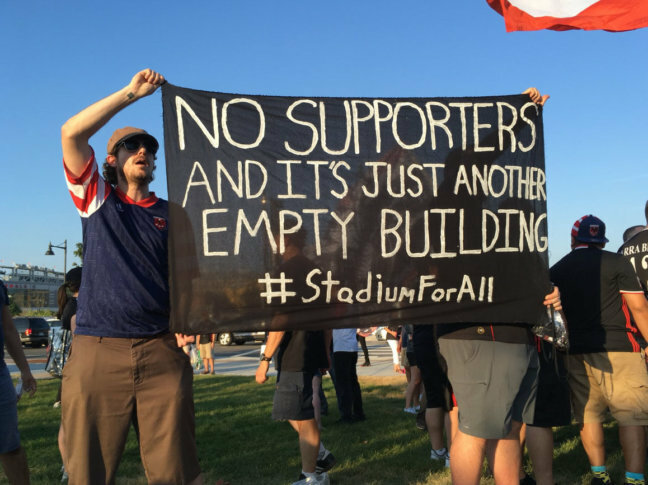 WASHINGTON — The mood among new and longtime fans outside Audi Field, D.C. United’s new stadium, ranged from relaxed anticipation to passionate protest on Saturday. While some fans milled about sipping beer, eating pizza and hot dogs and lining up to taste fare from a row of food trucks, there was a protest brewing. “That one mistake is not giving equal ticket access to all three supporters’ groups: District Ultras, La Barra Brava and Screaming Eagles,” he said. The protesters streamed onto the stadium grounds chanting, beating drums, and waving multiple flags — the D.C. United flag, and flags that represent the fan supporter groups La Barra Brava and District Ultras. Another person dissatisfied with the exclusive deal made with the third fan club The Screaming Eagles said maybe folks in the team’s front office didn’t realize the effect it would have among fans. Pavalakos said some protesting fans had match tickets and planned to continue the protest inside the stadium. They would enjoy the match but would not add to the atmosphere with their usual sonic contributions. “Anybody that does go in is going to sit on their hands. No jumping, no singing, no drums,” he said. 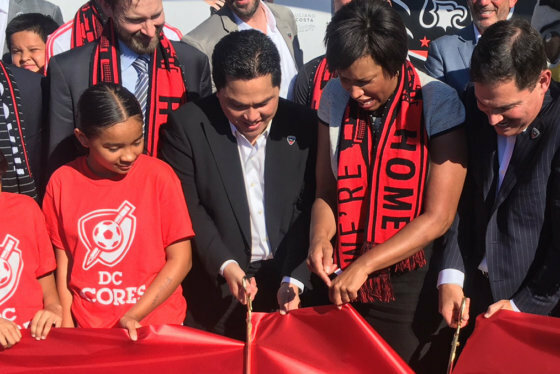 Those who were not protesting were excited about D.C. United’s first game at the brand-new facility. Several fans were spotted exiting the Club Shop with brand-new shirts that they changed into right outside the store. Other fans wanted to “basically see the start of a new era. New stadium, new fans coming out, seeing it fill up — we’ll see what happens,” said Xavier Coleman, who’s been a fan of the team for about a year. “The fan experience is going to be way more intense’ the atmosphere is going to be better. I’m really hoping they sell out every game from here on out. It’s a big enough city to support 20,000 fans every single game,” said a longtime fan who identified himself as Damon from Anacostia.